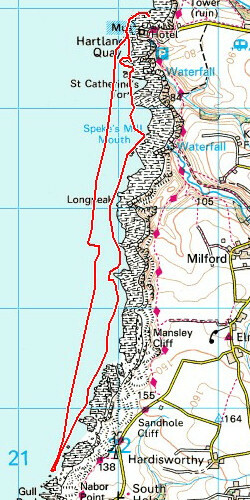 With a forecast wind of E-NE Force 4-5 decreasing to 3 for Hartland Point and E Force 5 for sea area "Lundy" it was open to doubt from the start whether the crossing to Lundy Island could go ahead. 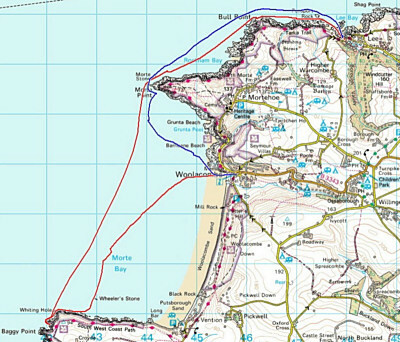 However the enthusiasm of the group knew no bounds and on the morning of Friday 14 July 2006 Chris, Alex, Hilary, Dan Jones, Peter, Luis, David Whittaker and Mark Haydon went to Lee Bay near Ilfracombe to at least take a look. It was hot and sunny and the water in Lee Bay was remarkably placid, although frequent white caps could be seen further out beyond the shelter of the bay. We decided to set out and see how conditions looked at Bull Point, the last contact with the mainland and pretty much our point of no return. The strength and direction of the wind started to cause difficulties for several paddlers almost as soon as we cleared Lee Bay so we decided to abandon the crossing and make our way to Woolacombe via Morte Point. After an outdoor pub lunch at Woolacombe we paddled across Woolacombe Bay to Baggy Point where we rested on a secluded beach until the tide had turned. Increasingly tired, we returned to Lee Bay directly from headland to headland against a moderate headwind, passing close under the stern of Trinity House Vessel "Patricia" at anchor in the bay. On Saturday the wind was considerably stronger so all thoughts of a second attempt at crossing to Lundy had to be dismissed and the majority of the group drove to Hartland Quay to explore the dramatically scenic West coast of the Hartland Peninsula before meeting up with Hilary and Peter at Tintagel. 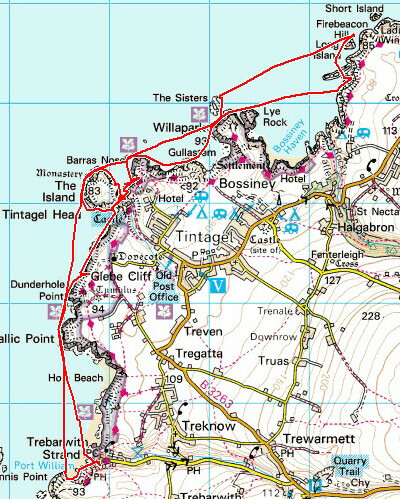 The following day we paddled from Trebarwith Strand north past Tintagel Island. Exploring a cave in Tintagel Island we found we could paddle all the way through and come out on the other side. Naturally there was some disappointment at not being able to make the crossing to Lundy Island but we were able to console ourselves to some extent by enjoying three days of superb coastal sea kayaking in some spectacular locations under clear blue skies and brilliant sunshine. Distances paddled: Friday 12.5 nm, Saturday 5.5 nm, Sunday 8.5 nm. Thanks to Luis Trevino and Mark Haydon, Peter and Hilary Lawrence (and Chris Stephens!) for the pictures.